Farewells are never sweet. This dessert warms sweetens and soothes your palate after a heavy main course. So simple yet so sophisticated. Take a nonstick pan, add butter. Once the butter melts, add the spices and sugar. Stir for a minute. Add the freshly sliced apples and stir again to coat. Cover and let them simmer for 10-15 mins(thinly sliced apples cook faster). Sprinkle drops of water instaed of additional butter, if it gets sticky. 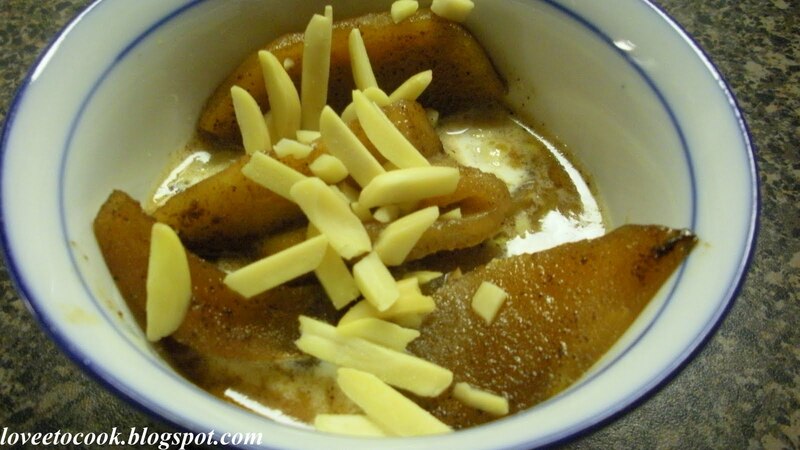 Serve hot with a garnish of almonds and chilled half and half in individual bowls. Awesome ! !